Book in One Word: MAGICAL. I purchased The Ocean at the End of the Lane when Neil Gaiman came to town for the book's tour over a year ago, and didn't think much of it afterward. I mean, I knew who Neil Gaiman was (does anyone not? ), and had read Coraline in elementary school, I think, and just remembered it being hella weird. 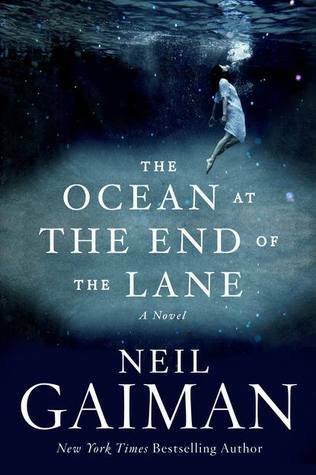 But then The Ocean at the End of the Lane was the book to read for book club, and it was time for twenty-one-year-old Rachel to see what she thought of Neil Gaiman, writing-wise. (In person he's enthralling, just so you know.) The verdict: I need to read more Neil Gaiman books. Going into Ocean, I don't think I really knew what it was about. I mean, I read the synopsis at some point once upon a time, but sometimes I don't read the synopsis when I actually read the book; I want to try to figure out the story without knowing much about it. So Ocean was a definite surprise. While this is categorized as an Adult novel, it is, for the most part, a story about a seven-year-old boy living in England. I want to say as little as possible so as not to spoil the story, but this boy finds himself taking part in an adventure of sorts with Lettie Hempstock, the youngest of the (fantasmical, need-their-own-book) Hempstock women who live at the end of the lane (and may have an ocean, among other oddities, residing on their land). And when the boy is off on a mission with Lettie and lets go of her hand--when Lettie tells you not to let go, you do not let go--he gets himself...well, I can't really tell you, because that would ruin the story. But I will say that, having read and seen Coraline, I could see bits of that book in here, like in that stupid, wicked witch (or a word that rhymes with the latter) Ursula Monkton. (She reminded me of the button-eyed mother in Coraline; not a good thing, because that mother is a bad news bear.) Ursula is the new nanny for the narrator--the boy--and his little (obnoxious, bratty, you-make-me-hate-children) sister. Everyone is extremely entranced by Ursula, except for the boy, who's like NO. He hates her, thinks she's evil (spoiler alert: she totally is), and refuses to eat anything because he thinks she's done something to it. Ursula isn't just some evil-seeming person; she's like a classic villain in a fairy tale, which adds to the entire feel of this magic realism book. And how do you defeat the villain in a story? Why, with the help of some magic and friends, of course. I could probably say a lot about this book, and delve into what was discussed and noticed and commented on in book club, but this is one of those books that you need to just read for yourself, not knowing much about it, to get the full experience. The Ocean at the End of the Lane is, in short, magical. I felt like it had this sort of Neverland/Wonderland quality, especially the former (cats pulled out of the ground!). This is about growing up and not, adulthood versus childhood, friendship, and adventure. It's a quick, short story, but there's enough content to make it feel like a full, filling novel. (Or kind of empty, if you feel like throwing up after a certain scene involving a worm, a foot, and tweezers.) Sure, I was a little confuddled at times, but that doesn't really matter. This book was GOOD. Neil Gaiman's writing was so simple and calm yet so much more, with its prose and details and storytelling. He makes you care about the characters and go along with their kind of unbelievable tales (and makes them believable and makes them work), and tells a story that's just, as I've said, magical. And maybe, just maybe, he'll make you want to shed a tear or two at the end. Now, where's my ocean at the end of the lane? Would I reread it? Possibly! Would I purchase it? Already have it! Who would I recommend it to? If you like reading books that feel like magic--and even if you don't--this is for you.